On March 30, 2014, Cody ChesnuTT restored my faith in R&B music. Over a decade ago, I first learned about Cody ChesnuTT when he was featured on The Roots cover of his own recording titled “The Seed.” I made a mental note then to keep an ear out for more music from him, but for whatever reason, his music and my ears just didn’t cross paths. Fast forward over a decade, and somehow I stumble on a live, radio-station, video performance of Cody performing songs off his latest release titled “Landing On A Hundred” without a backing band. I’m immediately amazed. It was a sound so raw and soulful, it made me think of all of those legendary R&B and soul singers of the 70s. Music from the heart. Music from the soul. I absolutely fell in love with the music. Some people have compared Cody to Marvin Gaye. After listening to “Landing On A Hundred”, I’m willing to make that comparison as well. As soon as my iPhone notified me that tickets for a show of his at the Troubadour were on sale (god-bless concert related iPhone apps! ), I purchased tickets. Having gotten permission from Cody’s management to snap pics of the gig, I got to the venue early with a friend to get up close and personal. I just knew, in my gut, that it was going to be a mind-blowing performance. I was right. When Cody, with his trademark helmet cocked on his head, and his band took to the stage, the audience erupted with a joy that I haven’t felt from an audience in a good while. 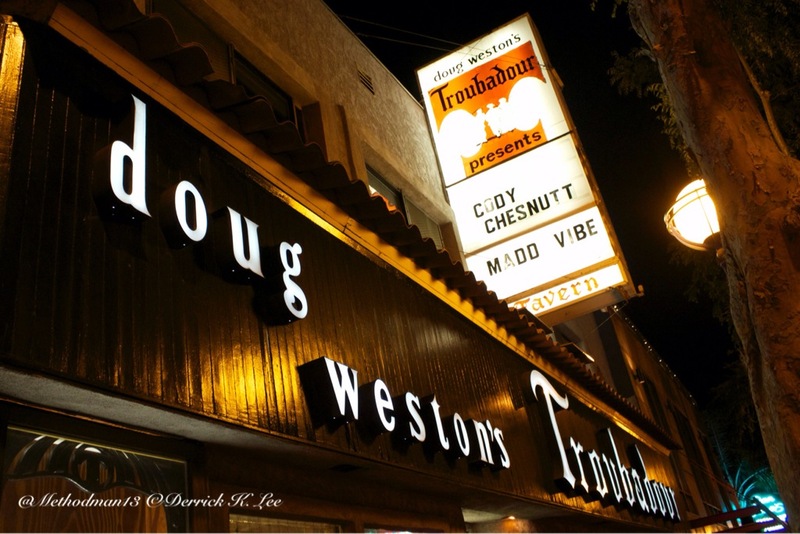 A sudden emotional warmth enveloped The Troubadour, almost as if the venue itself exhaled at that moment. It was, at least for me, a surreal moment. Cody’s performance was beyond enjoyable. In fact, with the breadth of emotion he revealed during his time on the stage; from pain, frustration and struggle, to joy, love and hope, I can truly say his performance is on my list of “favorites of all time”. Being able to capture some of those moments with my camera, gave me visual proof after the fact that I wasn’t just imagining it. What made the performance so real was Cody’s interaction with the crowd. He engaged us. He talked TO us. He made us understand why the music he was singing meant so much to him. For example, he told us how the music on The Headphone Masterpiece saved his life; and though the music from that album came from a different time and space, having its own unique vibe, he could sing some of those tracks in the present because they matched and marched with his current vibe. He explained that “Love Is More Than A Wedding Day” was his favorite song off “Landing On A Hundred”, further preaching to the audience that it takes effort to overcome martial struggles. He openly reminisced about the story of how his wife bought him his first guitar from a pawnshop; and how her belief in him and his dreams makes him want work that much harder to keep the relationship fresh. Before he performed “5 On A Joyride,” he explained that that track was written after he had gotten dropped by Hollywood Records and ended up in a car with four friends tripping on magical mushrooms cruising the streets of Los Angeles. He even took a moment to give a shoutout to Suge Knight for being a man who actually gave him the creative freedom to create during his stint on Death Row Records. I was blown away with Cody’s live show. If you are a fan of R&B and Soul music that speaks from the heart, I beg you to attend one of his shows. You won’t regret it. For the setlist, please click through the slideshow.